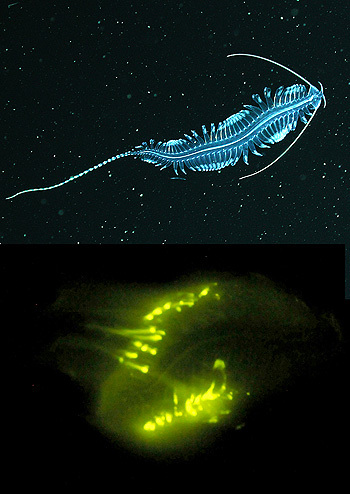 This image shows the siphonophore Frillagalma vityazi lit up by lights on a remotely operated vehicle (top) and emitting bioluminescence in the lab (bottom). A recent paper shows that 99.7 percent of siphonophores in Monterey Bay create their own light. Top image: © 2015 MBARI. Bottom image: Steve Haddock © 2017 MBARI. Ever since explorer William Beebe descended into the depths in a metal sphere in the 1930s, marine biologists have been astounded by the number and diversity of glowing animals in the ocean. Yet few studies have actually documented the numbers of glowing animals at different depths. In a new study in Scientific Reports, MBARI researchers Séverine Martini and Steve Haddock show that three quarters of the animals in Monterey Bay waters between the surface and 4,000 meters deep can produce their own light. You would think it would be easy to count the number of glowing (bioluminescent) animals in the ocean, just by looking at videos or photographs taken at different depths. Unfortunately, very few cameras are sensitive enough to show the pale glow of many marine animals. Below 300 meters (1,000 feet) the ocean is essentially pitch black, so animals don’t need to glow very brightly. Also most animals don’t glow continuously because making light takes extra energy and can attract predators. Because of the difficulty in counting glowing animals at depth, most previous estimates of the proportion of glowing animals were based on qualitative observations made by researchers peering out the windows of submersibles. Martini and Haddock’s study is the first ever quantitative analysis of the numbers and types of individual glowing animals at different depths. The researchers compiled data on every animal larger than one centimeter that appeared in video from 240 dives by MBARI’s remotely operated vehicles (ROVs) in and around Monterey Canyon. They counted over 350,000 individual animals, each of which had been identified by MBARI video technicians using a vast database known as the Video Annotation and Reference System (VARS). The VARS database contains over five million observations of deep-sea animals, and has been used as a source of data for more than 360 research papers. This graph shows the proportion of midwater animals that glow at different depths in Monterey Bay. Although there are more “undefined” animals in deeper water, the proportion of glowing to non-glowing animals is relatively similar at all depths. Image: Severine Martini © 2017 MBARI. Martini, the lead author of the recent study, compared the list of animals seen during the 240 ROV dives with a list of animals and animal groups that were known to be bioluminescent. This list was based on a review of previous scientific papers, as well as firsthand observations by Haddock and others. As an indication of the lack of research in this area, the most complete source of bioluminescence information for marine animals was a paper published in 1987, 30 years ago. Undefined (not enough information was available to determine if an animal is bioluminescent or not). Looking through the data, Martini and Haddock were surprised to find that the proportion of glowing to non-glowing animals was pretty similar from the surface all the way down to 4,000 meters. Although the total number of glowing animals decreased with depth (something that had been previously observed), this was apparently due to the fact that there are simply fewer animals of any kind in deeper water. Even though the proportion of glowing to non-glowing animals was similar at all depths, the researchers found that different groups of animals were responsible for the light produced at different depths. For example, from the sea surface down to 1,500 meters, most of the glowing animals were jellyfish (medusae) or comb jellies (ctenophores). From 1,500 meters to 2,250 meters down, worms were the most abundant glowing animals. Below that, small tadpole-like animals known as larvaceans accounted for about half of the glowing animals observed. 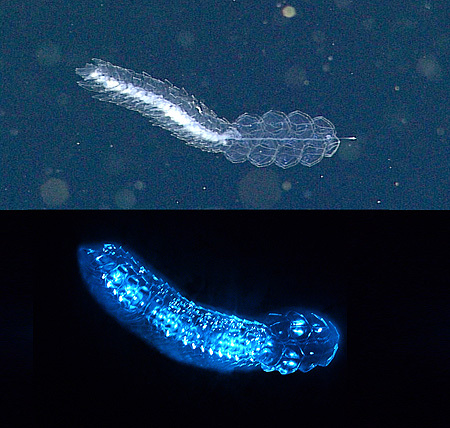 This image shows a deep-sea tomoptorid worm lit by lights on a remotely operated vehicle (top) and emitting bioluminescence in the lab (bottom). Tomoptorids are one of the few deep sea animals that emit yellow light. Top image: © 2002 MBARI. Bottom image: Steve Haddock © 2017 MBARI. The analysis also showed that some groups of animals were much more likely to glow than others. For example, 97 to 99.7 percent of the cnidarians (jellyfish and siphonophores) in the videos are able to produce their own light. In contrast, only about half of the fishes and cephalopods (squids and octopuses) are bioluminescent. The finding that the proportion of glowing to non-glowing animals is relatively constant at all depths suggests that scientists may be able to estimate the total numbers of animals at specific depths “just” by measuring the amount of light produced by animals at each depth. Unfortunately, researchers do not yet have instruments that can reliably measure the total bioluminescence from all animals at a given depth. But Martini is working on instruments that may be able to do this, and plans to publish her findings in a future paper. Martini, S.. and Haddock, S.H.D. Quantification of bioluminescence from the surface to the deep sea demonstrates itspredominance as an ecological trait. Scientific Reports 7, 45750; doi:10.1038/srep45750 (2017). November 28, 2018 – Deep in the Gulf of California MBARI researchers watched shrimp "play dead" by hanging motionless in the water. They speculate that the shrimp do this to avoid being eaten.